Once you've got that engagement ring on your finger you will be eager to show it off to your friends. But traditional etiquette maintains that your parents and your children, if you have any should find out first, and you must never show off your engagement ring before the marriage proposal has really been made. Let us provide you with all you need to know to plan your wedding from the moment you become engaged to the moment you and your beloved wave farewell to your guests after the reception and beyond! 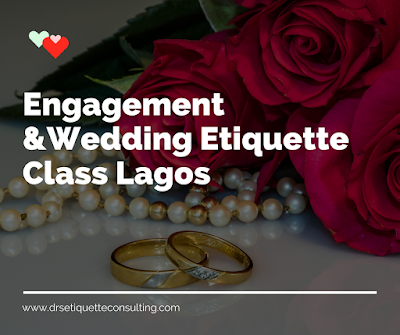 Email at drsetiquetteconsulting@gmail.com or WhatsApp 📱08170768650 for more info on our engagement and wedding etiquette classes.